For the Sufi teacher, see Vilayat Inayat Khan. For the Agra Gharana Singer, see Vilayat Hussain Khan. 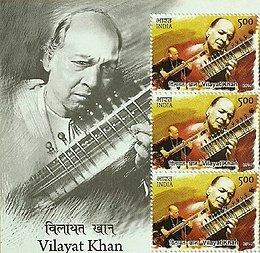 Ustad Vilayat Khan (28 August 1928 – 13 March 2004) was an Indian classical sitar player. Along with Imdad Khan, Enayat Khan, and Imrat Khan, he is credited with the creation and development of gayaki ang (an attempt to mimic vocal music) on the sitar. He recorded his first 78-RPM disc at the age of 8, and gave his last concert in 2004 at the age of 75. Vilayat was born in Gouripur, Mymensingh in then East Bengal in British India and current Bangladesh. His father Enayat Khan was recognised as a leading sitar and surbahar (bass sitar) player of his time, as had been his grandfather, Imdad Khan, before him. He was taught in the family style, known as the Imdadkhani gharana or Etawah Gharana, after a small city close to Agra where Imdad Khan lived. However, Enayat Khan died when Vilayat was only nine, so much of his education came from the rest of his family: his uncle, sitar and surbahar maestro Wahid Khan, his maternal grandfather, singer Bande Hassan Khan, and his mother, Bashiran Begum, who had studied the practice procedure of his forefathers. His uncle, Zinde Hassan, looked after his riyaz (practice). As a boy, Vilayat wanted to be a singer; but his mother, herself from a family of vocalists, felt he had a strong responsibility to bear the family torch as a sitar maestro. Vilayat Khan performed at All Bengal Music Conference, as his first concert, organized by Bhupen Ghosh in Kolkata with Ahmed Jan Thirakwa on tabla. His performance at the concert organized by Vikramaditya Sangeet Parishad, Mumbai in 1944 drew the headline "Electrifying Sitar". In the 1950s, Vilayat Khan worked closely with instrument makers, especially the famous sitar-makers Kanailal & Hiren Roy, to further develop the instrument. Also, he liked to perform without a tanpura drone, filling out the silence with strokes to his chikari strings. Some ragas he would somewhat re-interpret (Bhankar, Jaijaivanti), others he invented himself (Enayatkhani Kanada, Sanjh Saravali, Kalavanti, Mand Bhairav), but he was first and foremost a traditional interpreter of grand, basic ragas such as Yaman, Shree, Todi, Darbari and Bhairavi. When he died from lung cancer in 2004, Vilayat Khan had been recording for over 65 years and broadcasting on All India Radio almost as long. He had been touring outside India off and on for more than 50 years, and was probably the first Indian musician to play in England after independence (1951). In the 1990s, his recording career reached a climax of sorts with a series of ambitious CDs for India Archive Music in New York, some traditional, some controversial, some eccentric. Vilayat composed and conducted the score for three feature films – Satyajit Ray's Jalsaghar (1958) in Bengali, Merchant-Ivory Productions' The Guru (1969) in English, and Madhusudan Kumar's Kadambari (1976) in Hindi. He also composed the music for a little-known documentary film in Bengali produced by Dr Barin Roy, entitled Jalsaghar; he won a Silver Medal for composing at the 1st Moscow International Film Festival. The Imdad Khan family is of Rajput lineage. In an informal continuation of his Rajput lineage, Vilayat Khan's father Enayat Khan kept a Hindu name of Nath Singh. Vilayat Khan himself composed many bandishes using the pen name, Nath Piya. In an interview given to Karan Thapar for BBC in early 2002, Vilayat Khan admitted to be having the Rajput name – Kahan Singh. Khan spent much of his life in Calcutta (now Kolkata). He was married twice.Vilayat Khan’s first wife was a beautiful Hindu socialite from Calcutta, (late) Monisha Hazra. He had three children from his first marriage: Yaman Khan, Sufi singer Zila Khan, and sitarist Shujaat Khan (b. 1960). By his second marriage, Vilayat Khan had one son, Hidayat (b. 1975), also a professional sitarist. Vilayat was survived also by his younger brother, Imrat Khan. The brothers played duets in their youth but had a severe falling-out and for years were not on speaking terms. Vilayat's nephews Rais Khan, Nishat Khan, and Irshad Khan are sitar players. Vilayat took few disciples other than his sons; among the best-known are Kashinath Mukherjee (younger brother of film director Hrishikesh Mukherjee) and Arvind Parikh. He also gave sitar lessons to Big Jim Sullivan, the famous English session musician. He trained his daughter, Zila, in sitar and vocal music and also made her a formal student in a ceremony in 1991. The ceremony appears in a documentary made in 1991 and also in India's Ministry of External Affairs film on his life, entitled Spirit to Soul. In 1964 and 1968, respectively, Vilayat was awarded the Padma Shri and Padma Bhushan awards – India's fourth and third highest civilian honours for service to the nation – but refused to accept them, declaring the committee musically incompetent to judge him. "Pointing out that sitar and its 'Parampara' (tradition) had seen the longest ever tradition in his family and his ancestors had chiseled the 'Gayaki Ang' (style mimicking vocal music), crucial to the playing of the instrument, Khan said no other 'gharana' was older than his in this arena." In January 2000, when he was awarded the Padma Vibhushan, the second highest civilian award, he again refused, going so far as to call it "an insult". This time he stated that he would not accept any award that other sitar players, his juniors and in his opinion less deserving, had been given before him. "If there is any award for sitar in India, I must get it first", he said, adding that "there has always been a story of wrong time, wrong person and wrong award in this country". He alleged that the Sangeet Natak Akademi had been influenced by lobby, politics and favouritism while deciding the awardees. Among other honours he turned down was the Sangeet Natak Akademi Award. For a while, he also boycotted All India Radio. The only titles he accepted were the special decorations of "Bharat Sitar Samrat" by the Artistes Association of India and "Aftab-e-Sitar" (Sun of the Sitar) from President Fakhruddin Ali Ahmed. When Time Stood Still with Kishan Maharaj (2006, Navras). ^ He kept his childhood interest in vocal music all his life, often singing in concerts, and composed khyal bandishes using the pen name Nath Piya. ^ a b "No Compromise in his Art- an interview with Vilayat Khan". The Hindu newspaper. 28 March 2004. Retrieved 7 April 2017. ^ "Ustad Imrat Khan – Light and Shadows". ^ "Sitar virtuoso Vilayat Khan is dead". Economic Times. 15 March 2004. Archived from the original on 31 January 2014. Retrieved 22 January 2012. ^ "Buddha condoles Ustad Vilayat Khan's death". Times of India. 15 March 2004. Retrieved 22 January 2012. ^ "India loses Sitar great". tourdates.co.uk. Retrieved 22 January 2012. ^ "Reliving the magic". The Telegraph. Calcutta. 9 December 2004. Retrieved 22 January 2012. ^ "Vilayat Khan, a maverick musician". The Hindu. 26 March 2004. Retrieved 22 January 2012. ^ Manjari Sinha (9 October 2009). "A life well lived". The Hindu. Retrieved 22 January 2012. ^ "1st Moscow International Film Festival (1959)". MIFF. Archived from the original on 16 January 2013. Retrieved 29 October 2012. ^ Deepak Raja (2003), booklet for Ulhas Kashalkar's Tribute to Vilayat Khan CD. India Archive Music IAMCD 1071, p. 21. ^ "Sufi singer Zila Khan to perform at Jamia". Sify news. IANS. 7 February 2011. Retrieved 22 January 2012. ^ Varinder Singh (21 March 2004). "Sammelan loses star guest". Tribune India. Retrieved 22 January 2012. Wikimedia Commons has media related to Vilayat Khan. The Autobiography of Ustad Vilayat Khan: Komal Gandhar; co-written with Sankarlal Bhattacharjee, Sahityam, Kolkata.